When is a Porsche not really a Porsche but still a Porsche? Thanks to K-Roll I have been looking for a cheaper air cooled project. I don’t care if the paint is gone, I want to DD it. Any way, I have never quite understood the, “let me put a kit on my Porsche to make it look like a newer Porsche cause I can’t afford the newer Porsche and I want to ruin my older Porsche” mentality. It straight up confuses me. 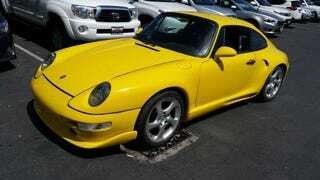 It also looks like a real life rendering of an anime 993. Why? What possessed this person to think, yes I want my car to look like a new version of my car because it will never preform like it, but people don’t know that.... Hell the people who won’t be able to tell are the same people who can’t see the model differences in 911s unless they are all parked next to each other.